Given the iconoclastic nature of Islam, images on Islamic coins are rare, but yet not unknown. Many of them were inspired by classical representations (like the bronzes of the Artuquids, Zangids and other Atabegs in the region) or survived when the coinage in question succeeded a pre-Islamic variety (like the Arab-Byzantine and Arab-Sassanid series or the Islamic successors to the bull and horseman Shahi Jital). Graven images are not unknown in the coinage of the Seljuqs of Rum. However, between 1240-1243 Sultan Kaykhusraw II (reigned 1237-1246) introduced a rather unusual coin – the so called “lion and sun” dirhem. We have no records as to why this unusual coin was minted. It is not uncommon and is a favorite of collectors. The Lion and Sun motif is itself deeply rooted in the history of the region – notably Mesopotamia and Iran. However, the Sultanate of Rum never ruled those territories. There are also connections to the zodiac, since in Islamic astrology the Lion is in the house of the sun. Romantics like to believe that the imagery refers to the Sultan’s beloved Georgian wife Tamar. In this interpretation the Sun represents Tamar and the lion the Sultan. Alternatively, it may represent her sun sign. All of this is speculation. What we do know that for a few years in his short reign, Kaykhusraw II minted these unusual coins. The mintage of these coins appears to have terminated when the great disaster of his reign occurred. On June 26, 1243 the Seljuq armies led by Kaykhusraw II were annihilated by the Mongols at the Battle of Köse Dağ. The Sultan held on to his throne in vassalage to the Mongols and promising annual tribute. However, the glory days of the Seljuqs were over. Kaykhusraw II died a broken man three years later leaving three minor sons. Absent a competent successor, the Sultans became playthings of their advisers and the Seljuq state disappeared by the end of the century. The reign of Kaykhusraw II by itself is a cautionary tale of a powerful monarch humbled at the height of his power and the coin is an interesting memento for his reign, but for the discovery of a unique coin minted a few years later thousands of miles away. The Mongol invasion of Persia in the early 13th century devastated the region. In destroying the Kharvazemian Empire they reduced the great urban centers of the region into mountains of skulls. The eastern part of the region was already in turmoil. The assassination of Sultan Mu’izz al-Din Muhammad in 1206 abruptly terminated the Ghurid Empire. Having no sons, the Ghurid Empire fragmented among his Turkish slaves as regional kingdoms sprouted in Delhi, Multan, Ghazni and Bengal. The Kharvazemians conquered Afghanistan in the next decade, but had not consolidated their gains before the Mongols invasion. While the Kharvazemian Sultan Ala ad-Din Muhammad II fled to the Caspian Sea his heir Jalal ad-Din Mingburnu desperately tried to rally the Empire in the East. Defeated at the Battle of the Indus and denied an alliance by Sultan Iltumish of Delhi he plundered Sindh before heading back to Persia and his ultimate end in Azerbaijan. Having eliminated the Kharvazemian empire the Mongols left some garrisons in the region, but Sindh and the neighboring areas were in turmoil. In the aftermath of the defeat of Nasir-ud-din Qabacha by Iltumish an adventurer called Hasan Qarlugh gradually took control of the region. Transferring his vassalage from Delhi to the Mongols, he took advantage of the weakness of the Delhi Sultanate following the death of Iltumish to consolidate his rule. He was succeeded in 1249 by his son Nasir al-din Muhammad who tactfully balanced Delhi and the Mongols to hold on to power. In the long run this was unsustainable and the dynasty was eliminated by the Mongols in the 1260s. At some point in his reign, Nasir al-din Muhammad minted the coin below. QARLUGHID: Nasir al-Din Muhammad, 1249-1259, AR dirham (2.55g), NM, ND, A-L1817, previously unknown type, published on Zeno as #120013, in December 2012 (this specimen, believed to be unique), 1 testmark, VF, RRRR. 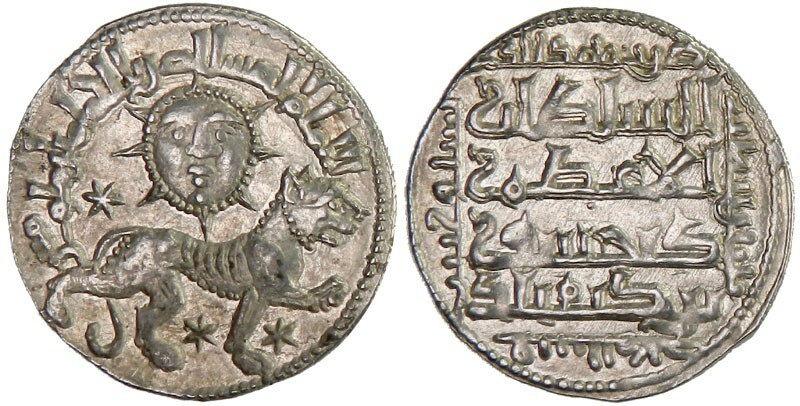 Obverse has name nasir al-dunya wa’l-din in Arabic above the lion, the reverse has his name & patronymic in Nagari script (sri mahamada hasana karaluka). This is the first reported silver coin for this ruler, Nasir al-Din Muhammad and previously an unknown type. This specimen published on Zeno as #120013, in December 2012 and believed to be unique. The inspiration for the coin is obvious. Yet the coin is different. It is bilingual (not unknown in the region) with inscriptions in Arabic and Nagari. Prior to this the only other known coins for this ruler were his copper jitals (which also carry inscriptions in Nagari). This is a unique coin and the mintage was probably low. It was minted within a decade after the Seljuq series and appears to be derived directly from that series – albeit with cruder celatorship and with local flavor added. It is interesting to speculate how a Seljuq prototype reached Sindh. Trade is an obvious choice. With land trade routes disrupted by the Mongol invasion sea trade routes are a probable option. In addition, Kaykhusraw II paid the Mongols tribute in the aftermath of his victory. This probably speeded the dissemination of the Lion and Sun dirhem into international trade routes. What is striking how quickly the Qarlughid imitation appears to have been minted. In an age where modern nation states try to restrict the hobby of numismatics on the grounds of “cultural patrimony” this coin serves as an example of the basic fact – coins were meant to be circulated and traveled long distances. This is why Roman coins have been found in South India (and imitated there), 4th century Roman Bronzes were imitated in Sri Lanka and Islamic coins have been discovered in Northern Europe. Trade and taking a fancy to an unusual coin appears to have inspired an obscure Sultan in Sindh to imitate a coin minted by a dead Sultan thousands of miles away in Anatolia.